The small genome of the carnivorous, aquatic bladderwort packs a gene-rich punch that provides the unique plant with many of its special adaptations, according to a study published in Molecular Biology and Evolution in January. The Utricularia gibba genome contains 28,500 protein-coding genes, roughly the same amount as that of the Norway spruce, even though the spruce’s genome is nearly 250-fold larger. Researchers from the University of Buffalo, the University of Barcelona, and the National Genomics Lab for Biodiversity in Mexico, found evidence that the bladderwort genome had been duplicated three times, suggesting the plant had also undergone massive deletion events, resulting in its compact genome. Unlike many organisms, few of the bladderwort’s genes belong to larger gene families grouped by function, and its more than 10,000 “singleton” genes—where only one gene is responsible for a particular function—represent a larger proportion of the genome than in other plants. “When you have the kind of rampant DNA deletion that we see in the bladderwort, the genes that remain—and their functions—are the ones that were able to withstand this deletion pressure, so the selective advantage of having these genes must be pretty high,” study coauthor Victor Albert of Buffalo said in a statement. 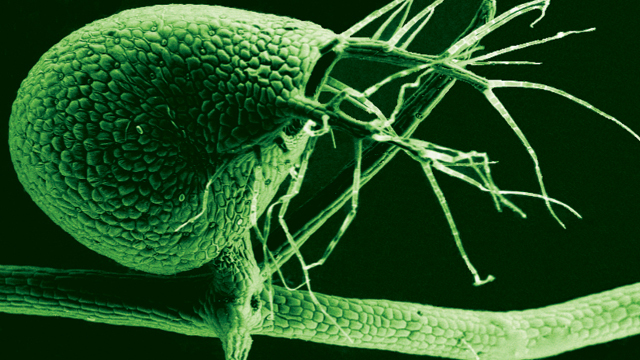 Among the bladderwort-specific adaptations the scientists found in a comparative analysis were unique versions of genes involved in cell-wall biosynthesis and the regulation of leaf and root development, which may be responsible for bladderwort’s adaptations to a watery environment. The researchers also identified genes that encode meat-digesting enzymes, including some similar to the pepsin found in human stomachs. To find new ways to combat the scourge of hookworm, which affects more than 400 million people worldwide, researchers from Cornell University, the University of Massachusetts Medical School, the University of California, San Diego, and Caltech sequenced the genome a hookworm, Anclyostoma ceylanicum, described this week (March 2) in Nature Genetics. The genome contains nearly 27,000 protein-coding genes, an additional 10,000 genes that encode shorter peptides that could be involved in parasitism, and at least one gene that originated from bacterial horizontal gene transfer. Although rare in humans, A. ceylanicum can infect both people and other animals. When the scientists analyzed gene-expression data at various stages of hookworm-caused disease in hamsters, they identified roughly 900 upregulated genes during the earliest stages of infection that encoded proteases, nucleases, and a variety of small secreted proteins. Of the genes with no mammalian equivalent, 13 had other homologs with enough structural information on their protein products to make them promising targets for vaccine and drug development. “We hope that by analyzing the genome, we can uncover clues that might help us alter [the] balance in favor of the host,” study coauthor Paul Sternberg of Caltech said in a statement. 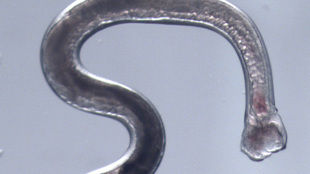 In addition to finding new ways to prevent or treat hookworm infection, the parasite’s genome may help researchers understand how hookworms suppress the immune system and what genetic changes allow the parasites to grow larger and live longer than relatives like Caenorhabditis elegans, which does not feed off of a host, the authors wrote in their paper. The full genome of a frog that dwells on the Tibetan Plateau, Nanorana parkeri, is the first to represent the Neobatrachia suborder that encompasses 96 percent of frog species. 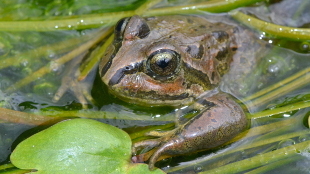 The frog’s genome, which contains 23,400 protein-coding genes, reveals a sequence rich in long terminal repeats (LTRs) that may hold clues about adaptations to living at high elevations with drastic temperature swings, high levels of UV radiation, and low oxygen, an international team led by scientists from the Chinese Academy of Sciences and Yunnan University in Kunming reported this week (March 2) in PNAS. The genome of the female Tibetan frog studied is 800 million base pairs larger than that of the only previously sequenced frog, Xenopus tropicalis, mostly due to the transposable elements that make up 48 percent of the N. parkeri genome. Unlike the transposon-heavy Xenopus genome, most of the 970 million bases of transposable elements in the N. parkeri genome consist of LTRs. By aligning the frog genomes with other vertebrate genomes, the scientists determined that the two species last shared a common ancestor some 266 million years ago. Consistent with previously reported genomes of cold-blooded animals like reptiles, this long evolutionary history suggests that frogs evolve more slowly than other vertebrates such as birds and mammals. The researchers also found 217 genes that were highly conserved in the frogs, including some involved in tongue development that could explain the animals’ ability to snap up flies with rapidly extending tongues. The genetic origins of the developmental schedule and stinky secretions of the Eastern tiger swallowtail butterfly have been revealed with the first full genome from a wild-caught specimen, which was described last month (February 12) in Cell Reports. 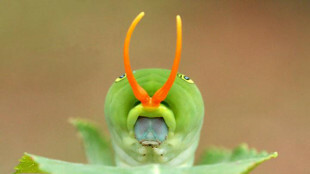 The caterpillar of the beautiful yellow and black butterfly resembles a snake, with two eyespots on its green body and a bright orange organ, the osmeterium, which resembles the reptile’s forked tongue. To help the caterpillar ward off predators, the osmeterium produces terpenes, foul-smelling molecules that waft through the air as the insect waves its colorful appendage. Previous transcriptome data from other species suggested that swallowtails, unlike other butterflies, have several different enzymes that make these chemicals. The Eastern tiger swallowtail genome, sequenced by researchers at the University of Texas Southwestern Medical Center, revealed 24 genes encoding terpene-synthesizing enzymes with different substrate specificities. The scientists also found key differences in circadian clock genes between the Eastern tiger swallowtail and its Canadian cousin, Papilio canadensis, which could help explain why P. canadensis winter in their chrysalises while P. glaucus do not. Despite this difference, the two species—which, according to transcriptome data, diverged roughly 600,000 years ago—overlap enough to have generated a hybrid species, P. appalachiensis, which shares 72 percent of its genomic material with the Canadian variety. A swath of the X chromosome that northern Chinese pigs inherited from an extinct ancestor may help explain how certain pig varieties adapted to the north’s colder climate, according to a study of 69 whole genomes from 11 swine varieties published earlier this year (January 26) in Nature Genetics. Although full pig genomes from Europe and Asia had been reported in 2012, the team led by researchers from Jiangxi Agricultural University in China wanted to investigate temperature-regulating differences among the more than 100 pig breeds developed in different parts of China. Characterizing the genomes of breeds that hadn’t been sequenced before, the scientists found 41 million single-nucleotide polymorphisms, half of which had not yet been documented. 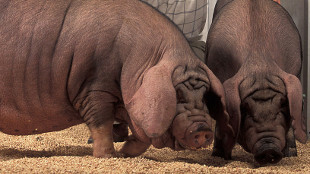 The researchers found only three breed-specific mutations, although each breed had a variety of mutations that clearly distinguished the genomes of Chinese pigs from their European cousins. The scientists also identified 219 autosomal genes involved in various aspects of body heat regulation, such as hair cell differentiation, kidney development, and the blood-platelet regulator VPS13A. Most strikingly, however, they found a 14 million base-pair stretch of the X chromosome that had two different forms, one shared among northern varieties and another common in southern breeds. By comparing the region to that of other pig genomes, the scientists determined that the split occurred around 8.5 million years ago, long before Chinese and European boars diverged. In fact, northern Chinese and European pigs shared more in common in this stretch of the DNA than northern and southern Chinese swine; further comparisons suggested that the gene adaptations the northern Chinese variety carries may have come from a now-extinct boar species. The genes behind a plant strategy to prevent self-pollination via flowers of different shapes have been uncovered in the first draft genome of the cowslip (Primula veris), according to a study published earlier this year (January 24) in Genome Biology. To prevent self-fertilization, some plants have developed heterostyly, meaning two or more varieties of flowers with complementary positions of the male and female organs such that pollen must be transferred between plants for mating to occur. 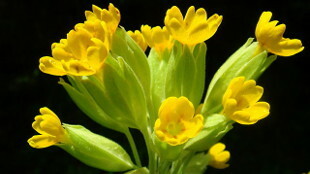 In the cowslip, each plant has one of two varieties of flowers: long ones—known as “pins,” or L-morphs—that have female pistils near the flower’s surface and male pollen-generating stamens deep inside the flower, and “thrums”—or S-morphs—in which the male and female positions are reversed. Pollinators that reach deep into pins can only transfer the pollen to S-morph flowers, and those that collect surface from pollen S-morphs should only successfully pollinate L-morphs. To understand this adaptation, researchers from the Universities of Zürich, Oslo, and Potsdam, Germany, assembled a draft P. veris genome of nearly 302 million base pairs, covering 63 percent of the full sequence. Next, the scientists compared transcription data from the cowslip and the closely related primrose (P. vulgaris) to identify 113 genes that were expressed differently between plants with the two different types of flowers. One gene in particular, PveGLO2, appeared to be unique to Primula species and was completely silenced in the long “pin” flowers. “The P. veris genome represents the first genome assembled from a heterostylous species, and thus provides an immensely important resource for future studies focused on the evolution and genetic dissection of heterostyly,” the authors wrote in their paper.